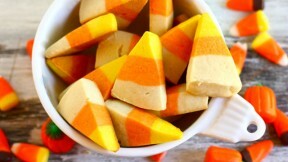 These cookies look like real candy corn! Kids of all ages will love this Halloween treat. Jenna Weber of Eat, Live, Run shares the story behind these cookies creates in a full post on the Fresh Tastes blog. Remove dough from mixer bowl and separate into three equal pieces (use a food scale to weigh each piece if you want to be exact!). Mix together a little bit of red and yellow food coloring to make orange and then add the orange coloring to one of the dough pieces. Make another dough piece yellow and leave the third plain. Place a piece of plastic wrap or tin foil inside a loaf pan and pat down the white dough inside. Place the orange dough on top (pat down firmly) followed by the yellow dough. Remove dough from pan, wrap up in either tin foil or plastic wrap and refrigerate overnight or for at least four hours. When you are ready to bake your cookies, preheat your oven to 350 degrees. Cut 1/4th inch slices down the width of the dough. Continue cutting each slice into small triangles. Place triangles on a lined baking sheet and bake for 6-8 minutes until tops are puffy and bottoms are golden.